Statins are widely used drugs for the treatment of hyperlipidemia. Though relatively safe, some individuals taking statins experience rhabdymyolysis, muscle pain, and cramping, a condition termed statin-induced myopathy (SIM). To determine if mutations in the skeletal muscle calcium (Ca2+) release channel, ryanodine receptor type 1 (RyR1), enhance the sensitivity to SIM we tested the effects of simvastatin, the statin that produces the highest incidence of SIM in humans, in mice with a mutation (Y524S, ‘YS’) in RyR1. This mutation is associated with malignant hyperthermia in humans. Exposure of mice with the YS mutation to mild elevations in environmental temperature produces a life-threatening hypermetabolic response (HMR) that is characterized by increased oxygen consumption (VO2), sustained muscle contractures, rhabdymyolysis, and elevated core body temperature. We assessed the ability of simvastatin to induce a hypermetabolic response in the YS mice using indirect calorimetry and to alter Ca2+ release via RyR1 in isolated flexor digitorum brevis (FDB) fibers from WT and YS mice using fluorescent Ca2+ indicators. We also tested the ability of 5-aminoimidazole-4-carboxamide ribonucleoside (AICAR) to protect against the simvastatin effects. An acute dose of simvastatin triggers a hypermetabolic response in YS mice. In isolated YS muscle fibers, simvastatin triggers an increase in cytosolic Ca2+ levels by increasing Ca2+ leak from the sarcoplasmic reticulum (SR). With higher simvastatin doses, a similar cytosolic Ca2+ increase occurs in wild type (WT) muscle fibers. Pre-treatment of YS and WT mice with AICAR prevents the response to simvastatin. A mutation in RyR1 associated with malignant hyperthermia increases susceptibility to an adverse response to simvastatin due to enhanced Ca2+ release from the sarcoplasmic reticulum, suggesting that RyR1 mutations may underlie enhanced susceptibility to statin-induced myopathies. Our data suggest that AICAR may be useful for treating statin myopathies. Statins (3-hydroxy-3-methylglutaryl coenzyme-A (HMG-CoA) reductase inhibitors) are cholesterol-lowering drugs that have proven effective in decreasing low-density lipoprotein (LDL) levels and improving overall health . For the majority of patients, statins are well tolerated with few side effects. However, up to 10% of patients on a statin regimen display muscle-related symptoms including soreness, fatigue, and an increase in circulating levels of muscle-specific proteins (for example creatine kinase (CK)) that results in a condition termed statin-induced myopathy (SIM) [2, 3]. A mechanism to explain the underlying cause of SIM has yet to be elucidated. One emerging theory of SIM has centered on statins’ potential to modulate intramyofiber calcium (Ca2+) homeostasis [4–6]. This theory stems in part from the finding that the direct application of simvastatin to healthy human myofibers triggers a significant increase in cytosolic Ca2+. The sudden release of Ca2+ in response to direct application of statins in vitro has been suggested to originate from both mitochondria and the sarcoplasmic reticulum (SR) [5, 8, 9], the predominant Ca2+ storage organelle within the myofiber. The potential involvement of the SR in statin-induced Ca2+ release is particularly intriguing given the recent findings that mutations in ryanodine receptor type 1 (RyR1), the Ca2+ release channel of the SR, may underlie some instances of SIM [10, 11]. Mutations in RyR1 are known to produce malignant hyperthermia (MH), a life-threatening condition where uncontrolled release of Ca2+ within the myofiber is triggered by exposure to certain volatile inhalants, elevated temperature, or exercise [12, 13]. This uncontrolled release of Ca2+ results in sustained muscle contractions, elevated core temperature, rhabdomyolysis and, if unabated, death . At present our understanding of the link between RyR1 mutations and statin myopathies has been limited to in vitro work with muscle biopsies. Metterlein et al. found that biopsied muscle from MH-sensitive swine exhibit contraction upon exposure to statins in vitro. Similarly, Guis et al. found that muscle biopsies from seven of nine human subjects exhibiting the signs of SIM expressed abnormal in vitro contracture tests (IVCT) used to screen for susceptibility to MH . These in vitro findings combined with evidence that simvastatin modifies Ca2+ homeostasis suggest that RyR1 mutations may underlie enhanced susceptibility to SIM. We developed a mouse model (Y524S, ‘YS’) with a RyR1 knock-in mutation of tyrosine 524 to serine , which in humans (Y522S) is associated with MH . Mice homozygous for the mutation die at birth, while heterozygous YS mice exhibit a hypermetabolic response (HMR) to elevated (37°C) temperature, volatile anesthetics, or exercise in a warm environment. These mice are a valuable tool for studying some RyR1-associated disorders. The purpose of the present study was to determine whether mice with this RyR1 mutation (Y524S) display HMR when given simvastatin and to evaluate the effects of simvastatin on intramyofiber Ca2+ homeostasis. All procedures were approved by the Institutional Animal Care and Use Committee at Baylor College of Medicine, Houston, TX, USA. As previously described, male RyR1Y524S/WT (‘YS’) mice were developed and used in conjunction with wild type (WT) littermate controls at 8 to 10 weeks of age. Mice were maintained on a 12:12 light:dark cycle, had ad libitum access to water and standard mouse chow, and were limited to normal cage activity only. All mice were sacrificed at the same time of day, consisting of cervical dislocation after anesthetization under isoflurane. Simvastatin was purchased from the manufacturer (LKT Laboratories, St Paul, MN, USA) in powder form. For studies involving injection into mice for indirect calorimetry, simvastatin powder was dissolved in dimethyl sulfoxide (DMSO). For single-fiber perfusion work, a 12 mM simvastatin stock was prepared in 10% EtOH similar to previous studies . After adjusting the pH to 7.0, the solution was brought up to 12 mM concentration in Tyrode’s solution containing 121 mM NaCl, 5 mM KCl, 1.8 mM CaCl2, 500 μM MgCl2, 400 μM NaH2PO4, 100 μM EDTA, 5.5 mM glucose, and 24 mM NaHCO3. Separately, a vehicle-only stock was prepared identically but without the addition of simvastatin. These prepared stocks were aliquoted and frozen at −80°C until use. Those YS and WT mice used to determine the effects of statin dosing in vivo were removed from their cage, weighed, and injected IP with an 30-80 mg/kg dose of either simvastatin dissolved in DMSO or DMSO alone (‘vehicle’). The mice were then returned to their cages for 30 minutes, after which they were placed individually into an environmental chamber at 32°C containing indirect calorimetry chambers (Oxymax System, Columbus Instruments, Columbus, OH, USA), which allowed for monitoring of maximum oxygen consumption (VO2 max (mL/kg/min)). Separately, to evaluate the effectiveness of a pharmaceutical agent shown previously to prevent heat-induced HMR response in YS mice , additional YS mice were injected IP with a 600 mg/kg dose of 5-aminoimadazole-4-carboxamide ribonucleoside (AICAR) 20 minutes after simvastatin injection. For mice destined for single-fiber Ca2+ study, the flexor digitorum brevis (FDB) muscle was removed and immediately placed into Dulbecco’s modified Eagle’s medium (DMEM) containing 3 mg/mL collagenase and 10% (v/v) fetal bovine serum. After a 2-hour incubation at 37°C, whole FDB muscles were transferred to 1 mL of DMEM and plunged ten times through a 1 mL pipette tip to separate individual fibers. Next, 150 μL of DMEM containing separated FDB fibers was placed onto a 25 mm glass coverslip that had been incubated for 2 hours with 20 μg/mg of laminin in PBS and then subjected to two washes in PBS and a final wash in DMEM. Prior to use, plated fibers were incubated overnight at 37°C in DMEM containing antibiotic-antimycotic (Gibco, Carlsbad, CA, USA). To assess the sensitivity to simvastatin, after the overnight incubation the fibers were next incubated for 1 hour at room temperature in either DMEM containing (10 μM) Fura-2 acetoxymethyl ester (Fura-2 AM) or 30 minutes in DMEM containing (5 μM) Mag-fluo-4, with (20 μM) contraction-inhibitor 4-methyl-N-(phenylmethyl)benzenesulfonamide (BTS). Fibers were placed in a temperature controlled chamber (Dagan Corporation, Minneapolis, MN, USA) on the stage of an inverted epifluorescence microscope (Nikon Inc, Melville, NY, USA) and warmed to 32°C over a 5-minute period in Tyrode’s solution. Fluorescence emission was captured using a high speed, digital QE CCD camera (TILL Photonics, Pleasanton, CA, USA). Each fiber was tested against a single dose of simvastatin, and peak fluorescence values were averaged across all fibers per group for each concentration. To determine the effects of simvastatin dosing, YS and WT fibers loaded with Fura-2 AM were perfused for 2 minutes in warmed (32°C) Tyrode’s solution for recording of baseline Ca2+ levels, followed by a 3-minute exposure at specified doses of simvastatin. Separately, isolated fibers used to test AICAR’s effectiveness at preventing the statin-modulated change in Ca2+ were pre-incubated in 1 mM AICAR in conjunction with the 1-hour incubation in DMEM/Fura-2 AM before exposure to 500 μM and 1 mM simvastatin in the YS and WT, respectively. Fura-2 fluorescence was recorded and converted to cytosolic Ca2+ values as previously reported . To evaluate the effects of simvastatin on SR Ca2+ store depletion, isolated fibers were exposed to 4-chloro-m-cresol (4-CmC) immediately after 3 minutes of incubation in 500 μM simvastatin. 4-CmC was applied to either YS or WT fibers at the dose found to induce maximal Ca2+ release without causing death of the individual fibers, which we determined to be 1 mM in the YS and 2.5 mM in the WT mice. A Student’s t-test was used for comparison between groups to test significance values of P <0.05 (*), P <0.01 (**), and P <0.001 (***). Dose–response curves were fit using 4-parameter (oxygen consumption (VO2)) or 3-parameter (single-fiber dose–response) Hill function curves in SigmaPlot, version 12.0 (Systat Software, San Jose, CA, USA). YS data was additionally fitted with a biphasic function using GraphPad Prism, version 6 (GraphPad Software, La Jolla, CA, USA). We previously demonstrated that changes in VO2 could be used to detect the HMR response in the YS mice exposed to elevated environmental temperatures . This approach allows early detection of the HMR and allows the mice to be euthanized prior to a full body contraction and death. To determine if statins also trigger an HMR response, we injected mice with an acute dose of simvastatin (IP 30 to 80 mg/kg) and placed the mice in the chamber (32°C, a thermoneutral temperature that does not trigger HMR in the untreated YS mice) of the indirect calorimeter and measured VO2 as a function of time after injection. All YS mice injected with 60 or 80 mg/kg simvastatin exhibited subsequent signs of HMR, which included increased VO2 (Figure 1A), severe muscle contractures and increased heat production. After injection with simvastatin, a significantly higher peak VO2 occurred in YS mice receiving 60 mg/kg (P <0.05) and 80 mg/kg (P <0.001) doses when compared against YS mice injected with the vehicle. Figure 1B shows the dose–response curve for peak VO2 as a function of simvastatin dose in the YS mice. 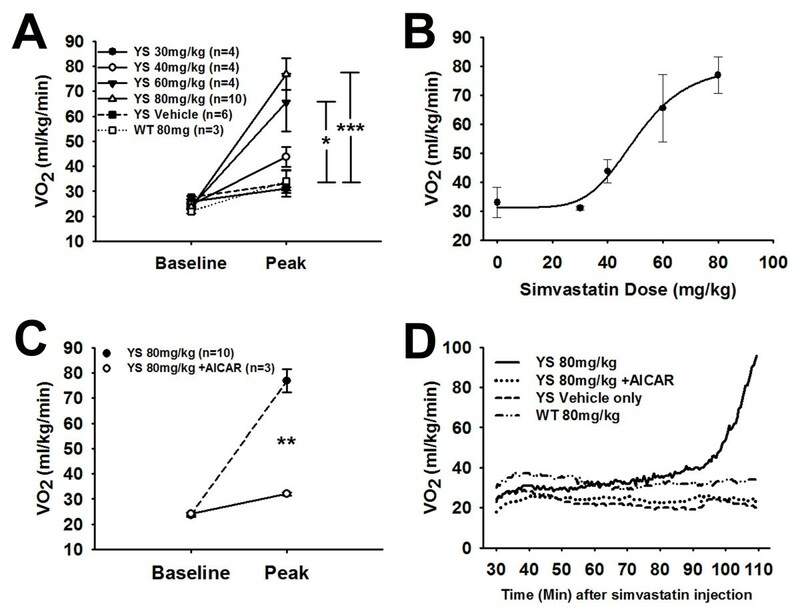 An acute dose of simvastatin at 32°C results in higher peak VO 2 levels in YS compared to WT mice. (A) IP injection of simvastatin triggers significantly higher peak VO2 values at 60 mg/kg (P < 0.05) and 80 mg/kg (P <0.001) compared to vehicle-only injection. (B) Curve-fit of increasing simvastatin doses in YS mice. (C) Pre-treatment with 600 mg/kg AICAR results in significantly (P < 0.01) lower peak VO2 values when administered 20 minutes after simvastatin treatment in YS mice. (D) Representative VO2 tracings of YS mice receiving 80 mg/kg of simvastatin show increasingly higher VO2 values than YS mice treated with both 80 mg/kg simvastatin and 600 mg/kg AICAR, vehicle-only (DMSO), or WT mice treated with 80 mg/kg simvastatin. AICAR, 5-aminoimidazole-4-carboxamide ribonucleoside; DMSO, dimethyl sulfoxide; VO2, oxygen consumption; WT, wild type; YS, Y524S. To determine if the statin-induced HMR event was similar to heat-induced HMR in the YS mice, we injected the YS mice with 80 mg/kg of simvastatin followed by 600 mg/kg of AICAR, which we have previously shown to prevent temperature-induced HMR in the YS mice by decreasing Ca2+ leak from RyR1 . AICAR eliminated the statin-associated HMR in YS mice by preventing the significant (P <0.01) increase in VO2 that occurs in YS mice not receiving the AICAR treatment (Figure 1C). The strong protective effect of AICAR on the simvastatin response of the YS mice suggests that statin-induced HMR in these mice is likely due to altered Ca2+ handling within the myofiber. We tested the effects of simvastatin in isolated FDB fibers of YS and WT mice using the fluorescent dye Fura-2 to assess changes in cytosolic Ca2+ concentrations. We found that simvastatin triggered higher cytosolic Ca2+ levels in YS fibers at lower concentrations (500 μM (P < 0.001) and 750 μM (P < 0.01)) than in WT FDB fibers (Figure 2). As previously shown with human fibers , WT fibers displayed increased Ca2+ in response to higher doses of simvastatin (1.5 mM (P <0.01)). The concentration response curves in the YS and WT mice were best fit using a Hill function (3-parameter) with a resulting EC50 of 0.6 mM in the YS and 0.9 mM in the WT mice. Since the YS fibers are from heterozygous mice, the Ca2+ response reflects the heterogeneous response from a mixture of mutant channels (in various combinations of mutation and WT subunits) and WT channels. Using a 2-site model, we obtain EC50s of 0.4 and 0.9 mM. Ca2+ concentrations were calculated from the Fura-2 fluorescence as described in Methods. Isolated fibers from YS mice exhibit increased sensitivity to simvastatin compared to WT mice. Dose–response curves from isolated WT and YS FDB fibers incubated for 3 minutes in respective doses of simvastatin. 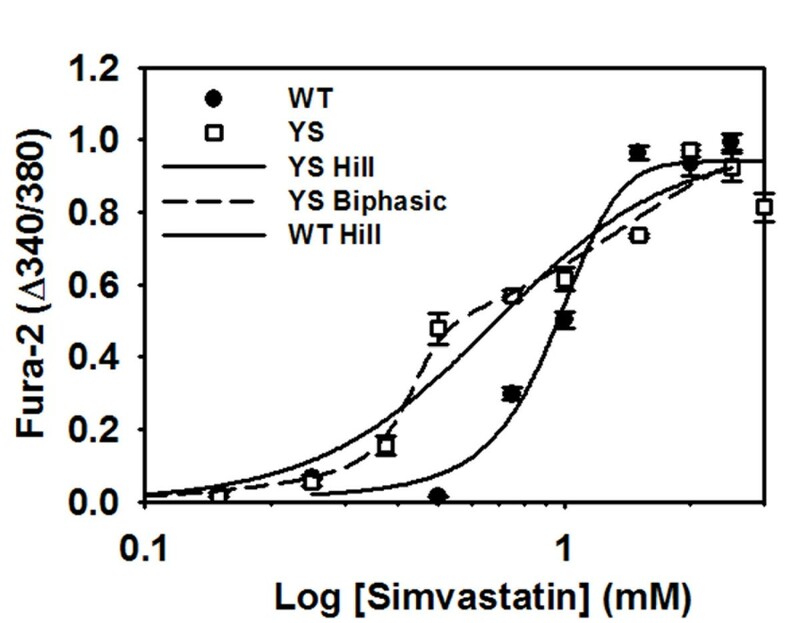 Data points reflect peak cytosolic Ca2+ change from baseline, indicating that fibers from YS mice respond to simvastatin at lower doses than WT fibers. Fibers were used only at a single simvastatin concentration. Each data point represents the mean cytosolic Ca2+ response from a minimum of three fibers taken from three separate mice. Ca2+, calcium; FDB, flexor digitorum brevis; WT, wild type; YS, Y524S. Ca2+ stores in YS FDB fibers are decreased by exposure to elevated temperatures . To determine if a reduction in Ca2+ stores occurs with simvastatin, we used Mag-fluo-4, a low-affinity Ca2+ indicator, and 4-CmC to assess the readily releasable SR Ca2+ stores . 4-CmC was applied to isolated fibers immediately after a 3-minute incubation with simvastatin. We found a significant (P <0.05) decrease in the readily releasable Ca2+ stores in YS fibers exposed to 500 μM simvastatin compared with YS fibers exposed to vehicle-only (Figure 3), while no difference was found in WT fibers at this concentration of simvastatin. This finding suggests that the increased cytosolic Ca2+ levels in the YS mice that occur after exposure to simvastatin are due to SR Ca2+ leak leading to SR Ca2+ store depletion. Pre-incubation with simvastatin decreases the 4-CmC-modulated cytosolic Ca 2+ response in isolated FDB fibers from YS compared to WT mice. Represented as the change (Δ) from baseline to peak values, (A) shows that upon exposure to 1 mM 4-CmC those YS fibers incubated for 3 minutes in 500 μM simvastatin (YS-Sim) release significantly less Ca2+ from the SR than YS fibers receiving vehicle-only (YS-Veh) incubation (P <0.01) and from YS fibers incubated in 1 mM AICAR followed by 500 μM simvastatin (YS-Sim + AICAR) (P <0.05). Numbers represent total fibers used per group from a minimum of three mice. (B) YS and (C) WT show representative Mag-fluo-4 fluorescence tracings in single fibers exposed to either simvastatin or vehicle. Arrows indicate the time point at which 4-CmC was applied to the fibers. AICAR, 5-aminoimidazole-4-carboxamide ribonucleoside; 4-CmC, 4-chloro-m-cresol; Ca2+, calcium; FDB, flexor digitorum brevis; SR, sarcoplasmic reticulum; WT, wild type; YS, Y524S. 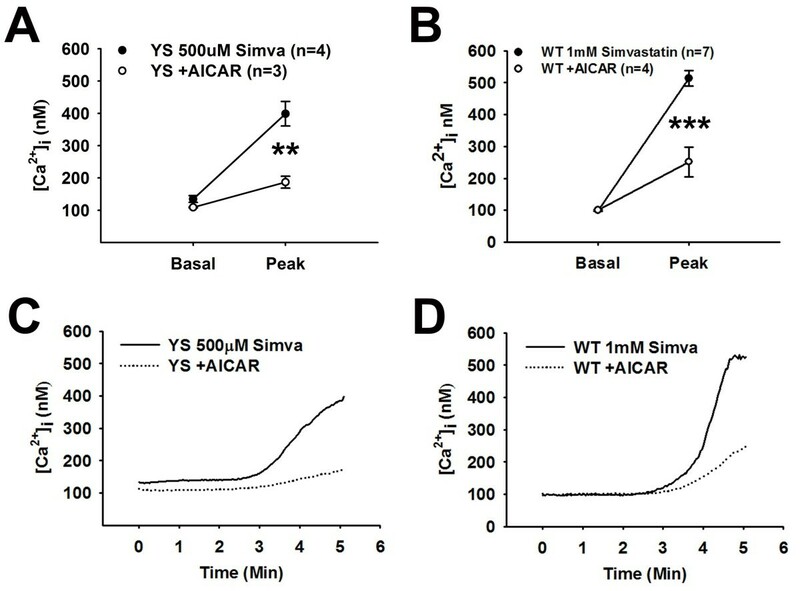 We assessed the ability of AICAR to regulate the simvastatin-induced increase in Ca2+ leak in the YS fibers. Isolated YS fibers were incubated with 1 mM AICAR prior to incubation with 500 μM simvastatin. As shown in Figure 4A, Ca2+ stores were protected from the simvastatin-induced depletion by prior administration of AICAR (P <0.01). We determined if AICAR could also prevent the simvastatin-induced Ca2+ release at higher simvastatin doses in WT mice (Figure 4B). 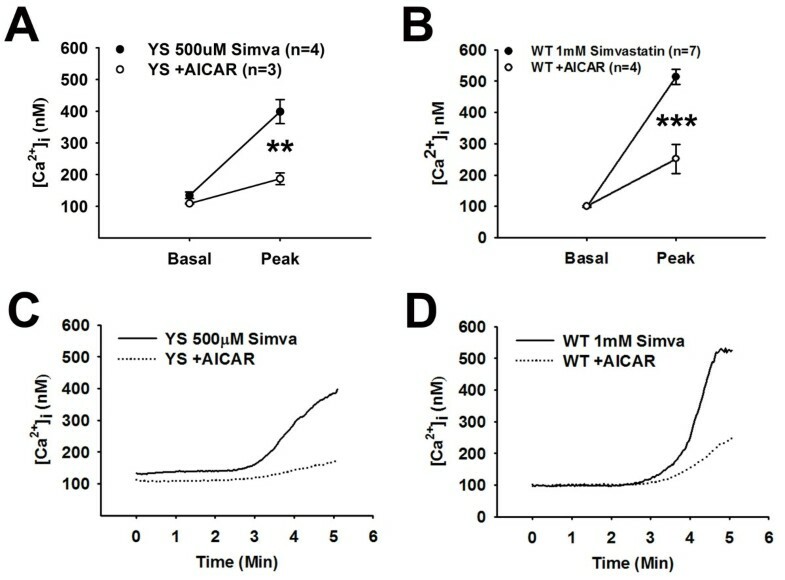 When WT fibers were incubated with 1 mM simvastatin, we found that AICAR pre-treatment also greatly decreased Ca2+ release in WT fibers (P < 0.001), suggesting that statins have the potential to trigger Ca2+ release in normal fibers but require higher simvastatin concentrations than YS fibers and that AICAR may be a useful intervention for SIM even in patients without RyR1 mutations. Pre-treatment with AICAR reduces the cytosolic Ca 2+ response to simvastatin. Pre-incubation with AICAR prevents Ca2+ release in (A) YS fibers exposed to 500 μM simvastatin (P <0.01) and in (B) WT fibers exposed to 1 mM simvastatin (P <0.001). (C) YS and (D) WT show change in Ca2+ concentration for AICAR-treated (dashed) and untreated (solid) fibers after exposure to either 500 μM (YS) or 1 mM (WT) simvastatin at 2 minutes . AICAR, 5-aminoimidazole-4-carboxamide ribonucleoside; Ca2+, calcium; WT, wild type; YS, Y524S. Despite the prevalence of statin myopathies, a mechanism to explain the underlying trigger has remained elusive. The current study’s objective was to determine whether a MH-associated defect in RyR1 increased sensitivity to simvastatin and whether AICAR, which prevents heat-induced HMR in the YS mice, blocked the response to simvastatin. We show that the YS mice display an MH-like response (elevated VO2, sustained muscle contractures, elevated body temperature) to an acute dose of simvastatin, and the degree of response is dose-dependent. Simvastatin also enhances SR Ca2+ leak and SR Ca2+ store depletion in FDB fibers from both YS and WT mice but the response in WT mice requires higher concentrations of simvastatin. In FDB fibers from both YS and WT mice, the response to simvastatin was prevented by AICAR, suggesting that even in WT fibers the effect of simvastatin involves RyR1. AICAR is a known activator of the energy sensing kinase, AMP-activated protein kinase (AMPK). We recently demonstrated, however, that AICAR also has a direct effect on RyR1 and rescues the YS mice from heat-induced sudden death independent of AMPK activation . We now demonstrate that treatment of YS mice with AICAR, which decreases Ca2+ leak in the presence of cellular levels of ATP , prevents the simvastatin-associated increases in VO2 and heat production as well as greatly attenuates Ca2+ leak from the SR upon exposure of FDB fibers to simvastatin. AICAR also largely eliminates the statin-induced Ca2+ release in healthy WT mice. These results suggest that AICAR might also be a potential therapeutic intervention to prevent statin myopathies associated with RyR1 mutations in sensitive individuals and protect against myopathies arising from high statin doses in individuals without RyR1 mutations. Alterations in Ca2+ signaling with simvastatin could explain many of the symptoms associated with SIM in humans including muscle fatigue, cramping, and increased levels of circulating CK. Depletion of stores contributes to fatigue, while increased resting Ca2+ is known to trigger Ca2+ release and muscle contraction, giving rise to muscle cramping similar to that which occurs in Brody disease. Brody disease results from a reduction in the number and activity of sarco/endoplasmic reticulum Ca2+-ATPase (SERCA) proteins in skeletal muscle, which inhibits the re-uptake of cytosolic Ca2+ during muscle activity [19, 20]. Individuals afflicted with Brody disease complain of fatigue as well as muscle cramping that is exacerbated during periods of increased activity such as exercise . These symptoms reflect those commonly reported among individuals experiencing SIM. Separately, elevated circulating CK levels among individuals experiencing SIM can also be explained by rhabdomyolysis triggered by the statin-modulated increase in cytosolic Ca2+ levels and activation of calpains [21, 22]. Elevated CK levels are commonly experienced by individuals experiencing SIM. An acute dose of simvastatin increases cytosolic Ca2+ levels within the myofiber and this increase occurs at lower simvastatin concentrations in the presence of a RyR1 mutation associated with MH in humans. The prevalence of genetic abnormalities capable of causing MH has been estimated to be as low as 1:3,000 . Whereas the incidence of SIM is relatively low (approximately 10%) among the millions of statin users, it is highly possible that those individuals exhibiting signs and symptoms of SIM are harboring an underlying RyR1 myopathy. Guis et al. showed that seven of nine individuals exhibiting symptoms of severe statin myopathy were found to have a positive IVCT, indicative of an underlying RyR1 abnormality . Therefore, further research is needed to determine whether individuals experiencing SIM also have mutations in RyR1. If true, drugs such as AICAR that modulate RyR1 activity can be investigated as a potential therapy for these individuals, which may allow continued statin use without the side effects associated with SIM. The YS mutation in RyR1 increases the sensitivity to the cholesterol-lowering medication simvastatin. This sensitivity is marked by systemic increases in VO2, muscle contractures and heat production due to a temporal release of Ca2+ into the cytosol from the SR. Pharmaceutical interventions that decrease Ca2+ leak from RyR1 (such as AICAR) prevent both the systemic manifestation of SIM and the statin-induced Ca2+ release from the SR in single fibers. We show that RyR1 mutation increases sensitivity to SIM, suggesting that individuals affected by SIM could harbor underlying RyR1 mutations and that AICAR may be an effective therapeutic intervention. Mark Knoblauch, Adan Dagnino-Acosta contributed equally to this work. This was supported by NIH grants 5R01AR041802 and 5R01AR053349 to SLH. A.D.A. was supported by a postdoctoral fellowship from the Mexican Council of Science and Technology (186607). We would like to thank the Mouse Phenotyping Core at Baylor College of Medicine, Houston, TX, USA, for the use and assistance with the Oxymax indirect calorimetry system. MK conceived and developed the study, conducted indirect calorimetry experiments, assisted with Ca2+ imaging experiments, performed statistical analyses, and prepared the draft manuscript. ADA conducted Ca2+ imaging experiments, assisted with analyses, prepared data, and assisted with manuscript preparation. SLH created and maintained the YS mouse line, assisted with study design and data interpretation, and assisted with manuscript preparation. All authors read and approved the final manuscript.